I think it is important to be consistent with your design approaches to problems if at all possible. But it would be naive to think that one approach or tool will be best for any problem. I had a threading issue to solve recently and I have been making heavy use of the new .NET 4 Task Factory in the TPL library. The problem was that there is one part of the system that must be single threaded and process incoming events in the order they were received. I was fully prepared to write a message queue or pump (or find one). I was delighted to find that the Task Factory has the ability to use a custom scheduler. The scheduler controls when tasks begin and how many threads are available to process incoming tasks. Perfect. I just needed a single threaded implementation that processes in the same order as they are queued. Even better, the MSDN documentation includes an article showing you how to do just this. The custom scheduler takes a constructor argument for number of threads to use in the pool. So in future if there is a change that allows the inclusion of more threads, this will be easy to change. Also, if I find a better way, I can revert back to the default task factory and its of the same type as the throttled factory, so that would be an easy change too. Seeing as the Task Factory used by my problem class is the same type as the default factory (just another instance, with a custom scheduler internal field), I can configure StructureMap to deal out the appropriate factory. Pretty cool stuff. Here's my final code for my scheduler, which is pretty much the same as the MSDN article above, with style changed etc. /// running on top of the ThreadPool. /// The maximum concurrency level allowed by this scheduler. /// The list of tasks to be executed. /// Whether the current thread is processing work items. /// Whether the scheduler is currently processing work items. /// specified degree of parallelism. /// Gets the maximum concurrency level supported by this scheduler. /// Queues a task to the scheduler. /// Attempts to execute the specified task on the current thread. /// Whether the task could be executed on the current thread. /// Informs the ThreadPool that there's work to be executed for this scheduler. /// execute in the order that they were queued. /// Initializes a new instance of the <see cref="OrderedTaskScheduler"/> class. Initializes an instance of the OrderedTaskScheduler class. Finally I wrote a test program to prove two things. First, that using the default Task Factory it _might_ complete tasks in a different order than they were queued into the task factory. And second, that by running with limited concurrency, ie 1 thread, this will guarantee the tasks are completed in the order they were queued. Using the default factory you can see that one or more tasks are completed out of order. Hence the "Failed" text. There are 500 tasks run, so there's a good chance it will complete some out of order if its possible to do so. 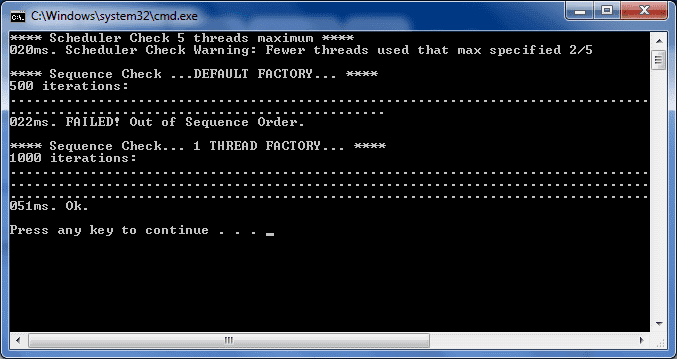 Lastly using the Limited Concurrency Scheduler with 1 thread, the results are in an expected order.